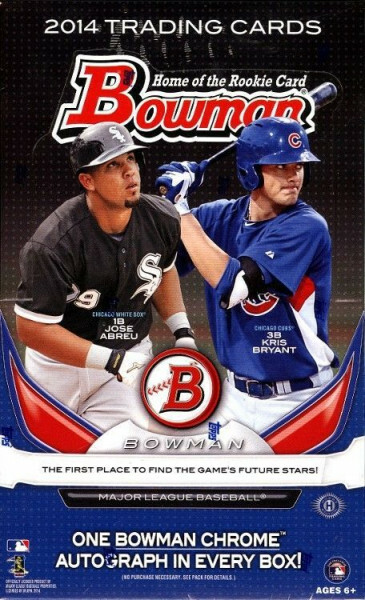 Factory Sealed 2014 Bowman Baseball Hobby Box mit 24 Packs a 10 Cards per Pack. Produktinformationen "2014 Bowman Baseball Hobby Box MLB"
- 1989 "Bowman is Back" Black Refractor Autograph: #'d to 25. Hobby & Jumbo NEW! - 1989 Bowman Autographed Buybacks: #'d to 5. Hobby Only NEW! - Green Refractor numbered to 75. NEW! - Black Refractor numbered to 99. NEW! - Black Refractor numbered to 35. Hobby Only NEW! - Prospect Autographs #'d to 50. Weiterführende Links zu "2014 Bowman Baseball Hobby Box MLB"
Fanbewertungen für "2014 Bowman Baseball Hobby Box MLB"